Saturday was Woodburry common day, a place you can’t do quickly. By the time we were done and headed back to the hotel, it was 8ish. 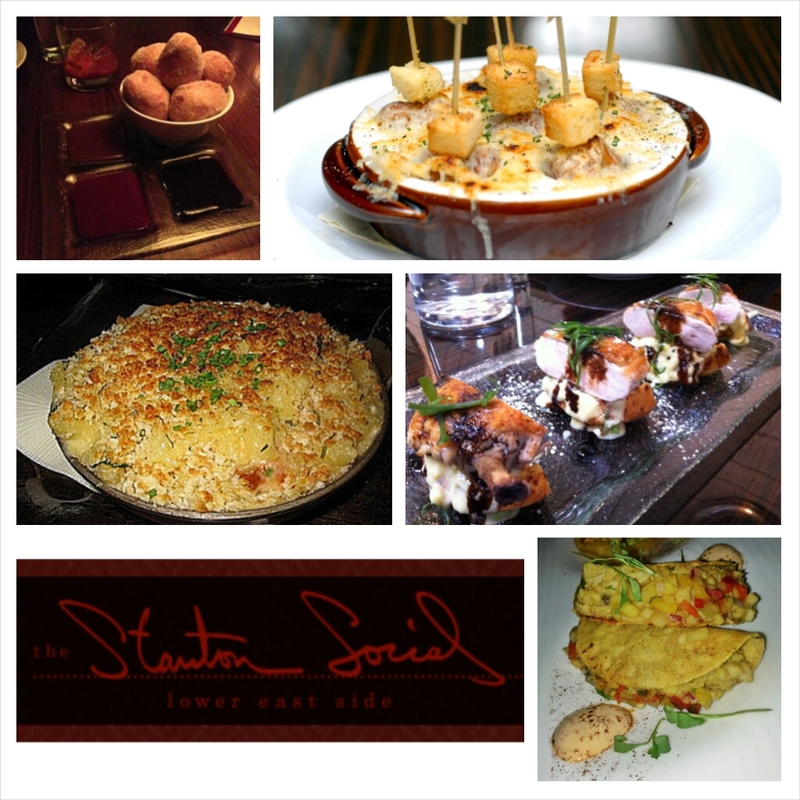 We were booked for dinner at Stanton Social with my cousin in-laws friends. Funnily enough Stanton Social didn’t appear on either of the lists I was given, but I’m so glad we were taken here as the food was so good, albeit not any particular type of cuisine. The table was book at a rather ambitious 9.30. Obviously given our mammoth trip to Woodberry, neither us or the locals were on our way until 10ish. We rocked up at the New York cool restaurant after walking straight past it when our cab dropped us off. Finally locating the door, we pushed through and were told to grab a drink at the bar whilst they prepared our table. By the time the others arrived, we stumbled down the stairs, cocktails in hands, only to be told we were going to be dining in the bar as we’d shown up far later than we’d booked. Slowly dragging ourselves back up the narrow staircase, we settled ourselves in whilst complaining about how loud the music was, unbeknown that as the night went on, the music only got better! For once I had very little to do with the ordering, Miss NYC got to it and did a bloody good job, ordering everything I would, including the French Onion Soup Dumplings which was how she sold the restaurant to us in the first place. French Onion Soup Dumplings – I can only really describe this as a cheese and pickle sandwich, in a ball, topped with a crouton. As odd as it sounds, it really was very good. The onion flavour came through in the pickle which really did taste like the good old English favourite – Branston Pickle. ‘Chicken n’ Waffles’ – The whole sweet and savoury flavour is fairly typical of american foods, what with the breakfast favourite of pancakes, bacon and maple syrup. This wasn’t that dissimilar in terms of flavour, the chicken was cooked well, but a little dry whilst the “aged cheddar waffle” was good, but didn’t at all taste cheesy. Not a bad dish, however neither I nor Miss Mel who had the other half of my portion braved the maple syrup. Red Snapper Tacos – These were served with avocado and a mango salsa, both of which really enhanced the flavour massively. Tuna Snapper Tacos – Although these weren’t on the menu, some how they appeared on the table and were absolutely amazing. 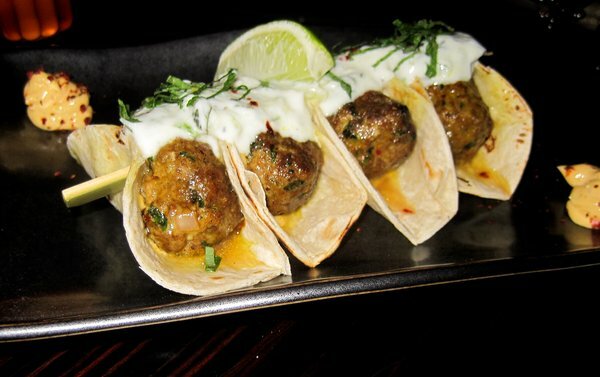 The tune was very fresh, the tacos were crisp and with a little squeeze of lime, these were perfect, I wouldn’t change a single thing. In fact, we liked them so much, we ordered another plate! Spicy Lamb Souvlakis – These again were delicious, the meat had the most amazing flavour, like seriously flavoursome. There’s not much more I can say other than wow. Mac & Cheese – The crumbly topping was a great addition to this rather cheesy mac and cheese. I’m not a massive fan but it did go down fairly well. I know for sure we did order a few other dishes, however given that I didn’t try them (the ravioli, potatoes, mini veg burgers) I can’t really give an honest opinion as to how they were. I can advise that the following day, both of the veggies on the table were still talking about the potato dish, however again I can’t seem to see it on the menu. We ordered a few deserts, but the only one worth mentioning was the Warm Doughnuts. These were in fact warm balls of yummy goodness, dusted in a cinnamon sugar. The amazing thing is they weren’t greasy at all & were served with 3 different sauces (Caramel, chocolate & raspberry), which really weren’t required. For anyone visiting New York, this “International Tapas” restaurant is most definitely one to visit. If you have no intention to speak to your fellow diners, then get seated in the bar, the music is great, the drinks are delicious and the food is amazing. If however you like to hear what your fellow diners have to say, request a table in the restaurant and don’t show up late! Ah amazing! Thank you Joanne, they were going on about them, I just didn’t get to try them! The Pickle I’m talking about is more of what Americans would refer to as a chutney, this particular one is very well known in the UK and is very often coupled with cheese in sandwiches – http://www.bringoutthebranston.co.uk/ Stay tuned for the last two entries of my New York Adventure!